Zara Alexandrova, Grazia Amendola, Paolo Ansaldi , ArriVSCeccarelli, Béatrice Bailet, Alessandro Boezio, Marco Bonaccolto, Sara Becchio e Paolo Borghino (StudioErrante Architetture) con Miriam Fabris e Emanuele Greco, Rada Boukova, Juan Cantizzani, Linda Carrara, Collectif Bancal, Dina Danish, Fabio Eracle Dartizio, Sandro Della Noce, Michela Depetris, Andres Donadio, Roberto Fassone , Cristina Gardumi, Wang Haiyuan, Ahmed Khaled, Glenda Léon, Simone Longo, Natalia Matta-Landero, Vittorio Mortarotti, Michéle Pagel, Mona Lisa Tina, Chiara Passa, Federica Peyrolo, Irene Pittatore, Andrea Pregl, Alessandro Quaranta, Jimmy Rivoltella, Andrea Roccioletti, Enrico Tealdi , Silvia Trappa. Tutte le iniziative saranno patrocinate e sostenute da Presidenza del Consiglio dei Ministri, Dipartimento della Gioventù, Regione Piemonte, Provincia di Cuneo, Città di Cuneo, GAI, Politecnico di Torino, Accademia Albertina di Torino, Ordine degli Architetti della Provincia di Cuneo, Associazione Origami. Gli sponsor principali sono: Compagnia di San Paolo, Fondazione CRC, Fondazione CRT, Il Porticone, Comitato Commercianti di Via Roma, di Contrada Mondovì, di Via Caraglio, di Via Dronero, Berardo, FerreroLegno, Lannutti, Nuovarekord, TPL. Gli sponsor tecnici: Abet Laminati, Best, Betulla Records, Castelmar, Cirifer, Degiovanni F.lli, Dott. Gallina, Edilplastubi, Fuoritempo, Market Compensati, Milano Assicurazioni di Sciarretta & C., Mollo noleggio, Oxley, Roagna Vivai, Segheria Pedona, Solaneon, T.M.P. Luogo: Giardini Fresia, Corso Giovanni XXIII, Cuneo. Luogo: Via Roma, Contrada Mondovì, Via Caraglio, Via Dronero, Via F. Cavallotti e Piazza Audifreddi, Cuneo. 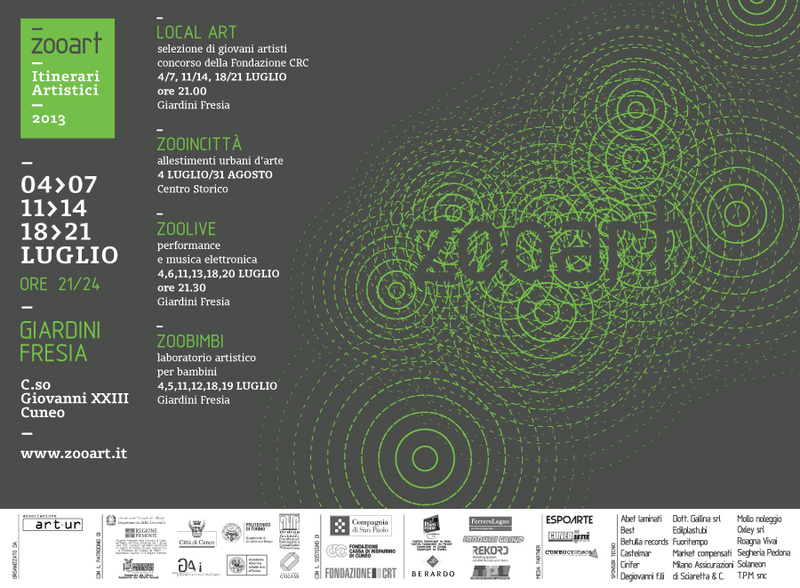 ZOOart inaugurates its twelfth edition with a smorgasbord of activities and events dedicated to the transmission of contemporary art in public spaces, 4 July at 9.30pm at the Fresia Gardens in Cuneo. The exhibition will again take place over many weeks, bringing life to the historical centre of Cuneo with its formula of outdoor evening events as has been proposed since 2002. The Fresia Garden, the old public zoo transformed into a recreational zone years ago, is the historical location for the event. It will be the background for installations produced or adapted for the occasion in a variety of artistic styles. More than thirty artists from Thursday until Sunday over the first three weeks of July will present their own artworks, on the theme of the multiplicity of relations between humans and their natural and cultural habitat. Performance art featured will involve the direct participation of visitors, and as the artistic journey develops, collective experimentation will take place in the streets of the city. Like each year, the ZOOart program will place an emphasis on the local artistic context, with the second edition of the project Local art, as well as attracting an array of international artists. Local art is a project of the CRC Foundation in collaboration with Art.ur to support artists from the Province of Cuneo, and will be a key aspect of ZOOart. Eight young artists selected by a committee made up of Claudio Cravero, curator of the P.A.V of Turin, representatives of Art.ur and the CRC foundation will have their artworks displayed during the three weeks of the exhibition: Paolo Ansaldi, Sara Becchio and Paolo Borghino (StudioErrante Architecture) con Miriam Fabris e Emanuele Greco, Michela Depetris, Roberto Fassone, Simone Longo, Vittorio Mortarotti, Alessandro Quaranta and Enrico Tealdi. The foundation will support the three winners by purchasing their artworks and promoting their visibility through the participation in national and international exhibitions. 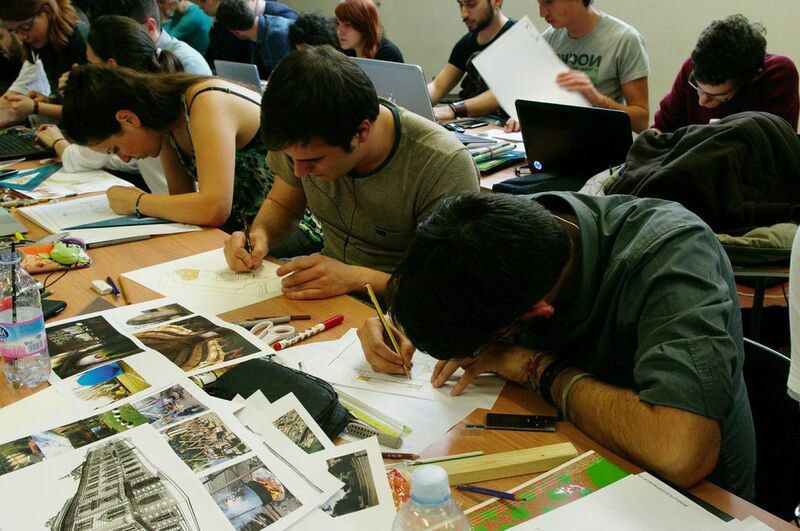 At the same time, the historical centre of Cuneo will be livened by the 2013 edition of the project ZOOincittà, consolidated by months of work undertaken by a specifically created workshop which was created in collaboration with the Order of Architects, the students who participated in the workshop of Professor Daniele Regis in the Department of Architecture and Design of the Polytechnic Institution of Turin and the Association Best Torino. 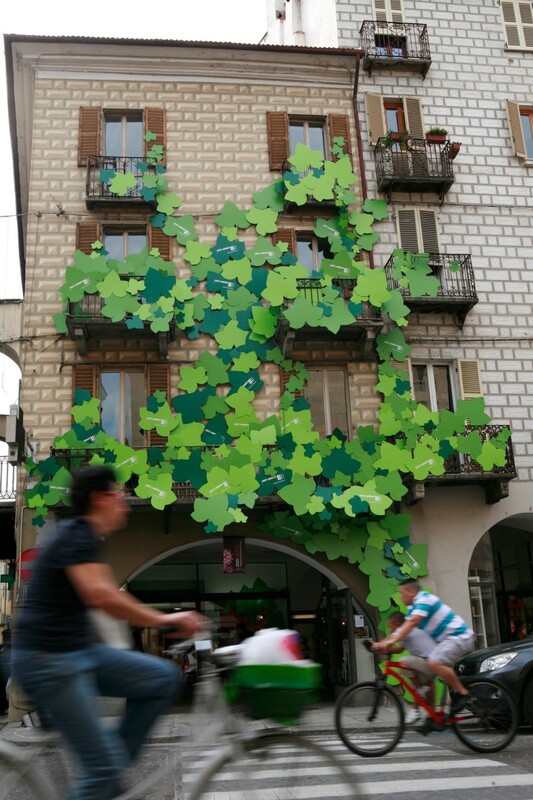 The site specific installations of the theme “Community” will be located in Via Roma, Via Mondovì, Via Caraglio, Via Dronero, Via F. Cavallotti, Piazza Audifreddi in Cuneo. They were produced over the last few months through the ZOOincittà workshops and selected from hundreds of propositions of young architects, designers and students within the Cuneo area and will be visible from 4 July to the 31 August. ZOOincittà has a vast number of participants and was created in partnership between the Association of Retailers including numerous businesses from the Piedmont territory and is supported by the Company San Paolo. During Thursday and Saturday evenings, in the three weeks of ZOOart from the 4 – 21 July in the Fresia gardens, the performances and live sets selected by Art.ur and the independent label Betulla Records will take place as part of the ZOOlive performances. 6 international performers will present their works at the ex-zoo or will involve visitors to the garden in stimulating and poetic collective events. Finally, the workshop “DlinDlinZumZumPeppé”, part of the ZOObimbi project will allow children to play with their imagination through the creative reuse of recycled materials by transforming them into musical instruments. The workshop ZOObimbi will also include the group theatre-fanfare coordinated by the French artist Béatrice Bailet, which is inspired by the fantastical journey in train from Cuneo to Nice, a train line which winds through the landscapes of the Alps and is currently in risk of being closed. 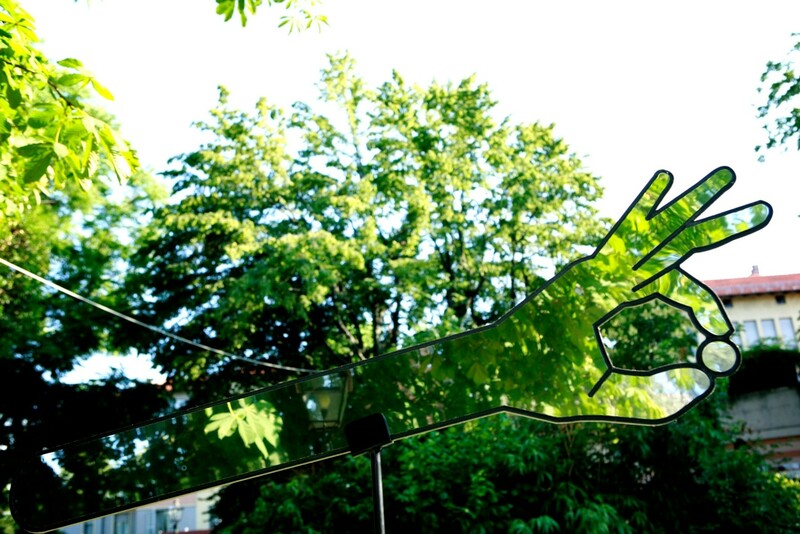 The workshop will take place in the Fresia Gardens on Thursday and Friday during ZOOart. The presentation of ZOOart and the works selected for the exhibition in public spaces ZOOincittà will take place in the form of a press conference, Friday 28 June at 5.30pm at the Salone d’Onore (reception hall) of Cuneo City. Zara Alexandrova, Grazia Amendola, Paolo Ansaldi , ArriVSCeccarelli, Béatrice Bailet, Alessandro Boezio, Marco Bonaccolto, Sara Becchio and Paolo Borghino (StudioErrante Architecture) with Miriam Fabris e Emanuele Greco, Rada Boukova, Juan Cantizzani, Linda Carrara, Collectif Bancal, Dina Danish, Fabio Eracle Dartizio, Sandro Della Noce, Michela Depetris, Andres Donadio, Roberto Fassone , Cristina Gardumi, Wang Haiyuan, Ahmed Khaled, Glenda Léon, Simone Longo, Natalia Matta-Landero, Vittorio Mortarotti, Michéle Pagel, Mona Lisa Tina, Chiara Passa, Federica Peyrolo, Irene Pittatore, Andrea Pregl, Alessandro Quaranta, Jimmy Rivoltella, Andrea Roccioletti, Enrico Tealdi , Silvia Trappa. All the initiatives are sponsored and supported by Presidenza del Consiglio dei Ministri, Dipartimento della Gioventù, Regione Piemonte, Provincia di Cuneo, Città di Cuneo, GAI, Politecnico di Torino, Accademia Albertina di Torino, Ordine degli Architetti della Provincia di Cuneo, Associazione Origami. The main sponsors are: Compagnia di San Paolo, Fondazione CRC, Fondazione CRT, Il Porticone, Comitato Commercianti di Via Roma, di Contrada Mondovì, di Via Caraglio, di Via Dronero, Berardo, FerreroLegno, Lannutti, Nuovarekord, TPL. The technical sponsors: Abet Laminati, Best, Betulla Records, Castelmar, Cirifer, Degiovanni F.lli, Dott. Gallina, Edilplastubi, Fuoritempo, Market Compensati, Milano Assicurazioni di Sciarretta & C., Mollo noleggio, Oxley, Roagna Vivai, Segheria Pedona, Solaneon, T.M.P. Location: Fresia Gardens, Corso Giovanni XXIII, Cuneo. Location: Via Roma, Contrada Mondovì, Via Caraglio, Via Dronero, Via F. Cavallotti and Piazza Audifreddi, Cuneo.